Garrison Green is a inner city community in southwest Calgary established in 1998; however, most of its homes weren’t constructed until several years later. Garrison Green is one community of three to replace the old military barracks decommissioned by the government in 1998. Garrison Green is a well-located, family-oriented community with many green spaces, parks and pathways giving the community a spacious, suburban feel even though you are living inner city. Here are 3 Reasons to Buy a Home in Garrison Green Calgary. 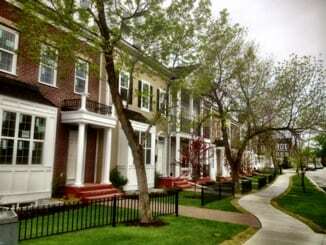 It truly is a beautiful community with a variety of homes including small bungalows, small to large single family homes, European style townhomes and some subsistence properties. Found throughout the community are several war monuments paying tribute to those who had lost their lives fighting for Canada. They are one of the many unique characteristics of this highly desirable community. Garrison Green has a small strip mall located at its entrance for basic amenity needs plus a variety of other small strip malls in close proximity. Some include a fire station, Mount Royal University, the Farmers Market, easy-to-access Calgary Transit routes, professional buildings and several amongst others. The neighbouring community of Currie Barracks has a vast expanse of commercial and retail space under development that will provide numerous services as well upon completion. Marda Loop business district is just across Crowchild that has over a hundred businesses available! Recreation is provided by multiple green spaces and parks in the community itself. A short walk south is the Glenmore Park that surrounds the reservoir. Walking a little bit further south and west is the Weaselhead Natural Area for added recreational opportunity, great for a serene walk or cardio workout. Public junior high school students are designated to attend A.E. Cross Junior High. Public transportation is provided for residents either from Mount Royal Gate SW and Crowchild Trail. North bound Crowchild Trail routes are accessible via an overpass and south bound routes are on the communities eastern border. Mount Royal Gate SW has different routes servicing that road too that loop into the University and outwards into the SW, eventually returning to LRT terminals such as Chinook or Heritage. Some routes Lakeview, Circle Routes, Chinook Station, South Calgary, Mount Royal, Mount Royal University, Sarcee Road, Richmond Road, Aspen Woods, Glenbrook, Elbow Drive and Sandstone. Getting to and from places without a motor vehicle is easy with the bus stops on Crowchild Trail that have frequent stop times. Garrison Green is an amazing, fairly new, family orientated inner city community with a quiet atmosphere that is comparable to a suburban neighbourhood. Considering on buying in Garrison Green? Our Calgary Home Buyers Guide will definitely lead you in the right direction. Questions about Garrison Green Calgary Homes? Call me at 403-370-4180 or message me below anytime and I will be more than happy to assist you. I look forward to helping you accomplish your real estate goals!